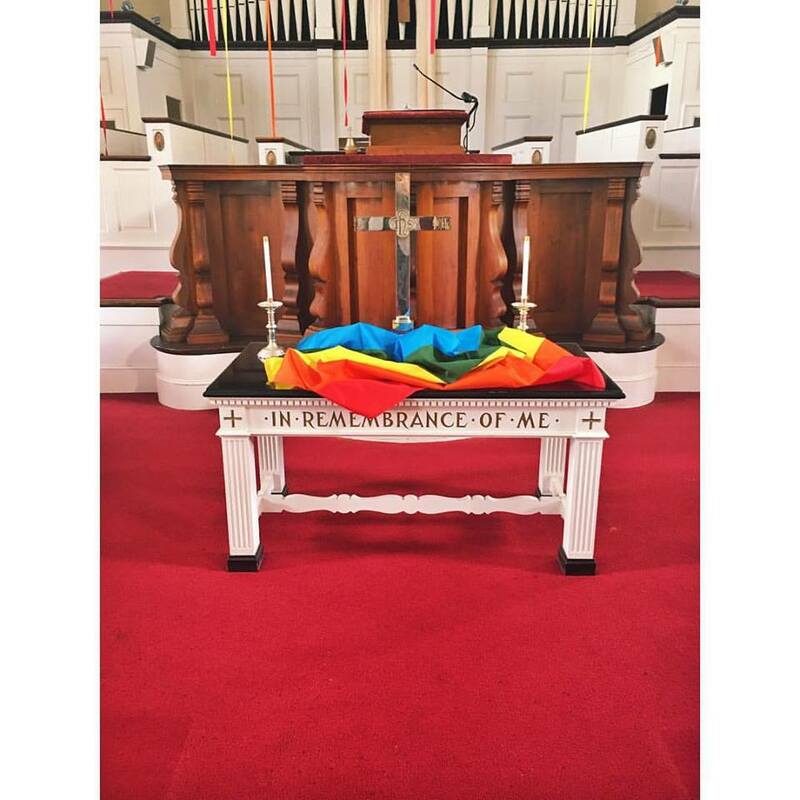 When I first moved to Connecticut, my congregation wasn’t officially Open and Affirming. 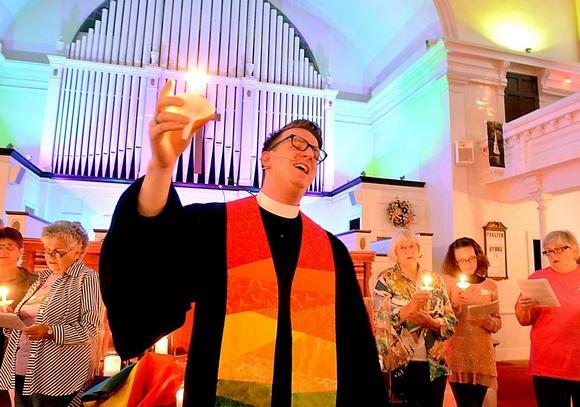 For the uninitiated, Open and Affirming (ONA) is an official designation within our denomination, the United Church of Christ, for congregations that welcome and affirm LGBTQ folks. It was 2012 and our interim minister, who was openly lesbian, had just left. The prevailing sentiment among my congregants was simple: “Why do we need to be officially ONA? We already welcome everyone. We welcomed you!” Which was true–they had welcomed me (enthusiastically, I would add). The three largest denominations in America (Catholics, Southern Baptists, United Methodists) comprise a total of nearly 102 million people. All three have policies or official stances against LGBTQ participation in one form or another. An additional 80 million people self-identify as Evangelical or “born again.” While there’s no unifying statement against the LGBTQ community, it isn’t difficult to guess where most of these folks land on the issue. At Westfield, we knew who we were. We knew who was welcome, that when I would stand up in front of the congregation week after week and proclaim, “Everyone, everyone, everyone is welcome”–we meant it. What became clear to us, though, was this: You don’t put your welcome mat inside your front door. You put it outside, so everyone knows they’re welcome. We knew who we were, but did others? 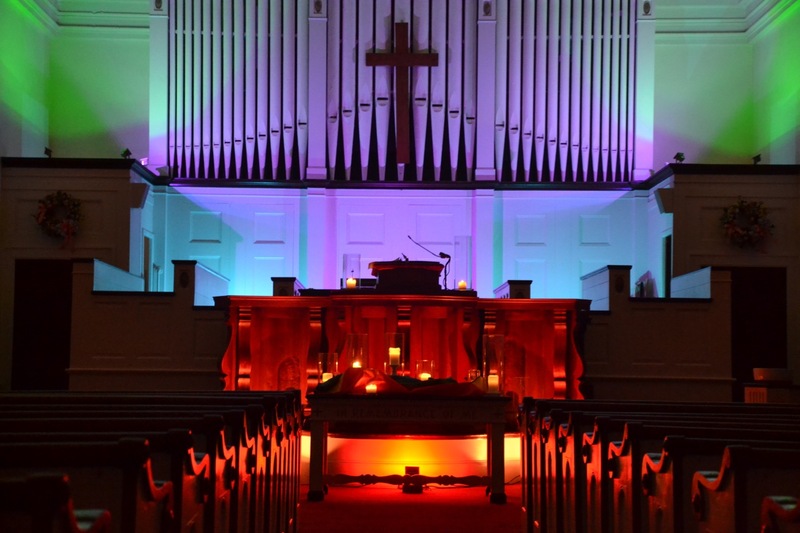 The congregation voted unanimously to become Open and Affirming in June of 2014. With that vote, the question became how exactly were we going to let others know the extent of our welcome? Enter a set of very colorful doors. 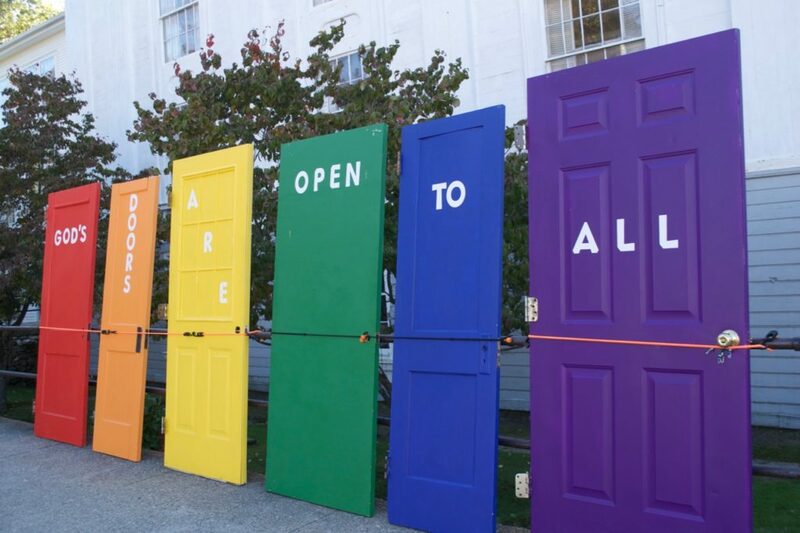 God’s Doors (or the Gay Doors as I jokingly call them) were our first big step into proclaiming who we are and what we believe. The message is simple. And it’s clear. We don’t just welcome folks. God does. We followed those doors up with more creative attempts to get our message out there. Next up, Christmas wreaths and Easter bunnies. It’s been twenty-two days since a deranged man walked into an Orlando gay club called Pulse on Latin night and started shooting. 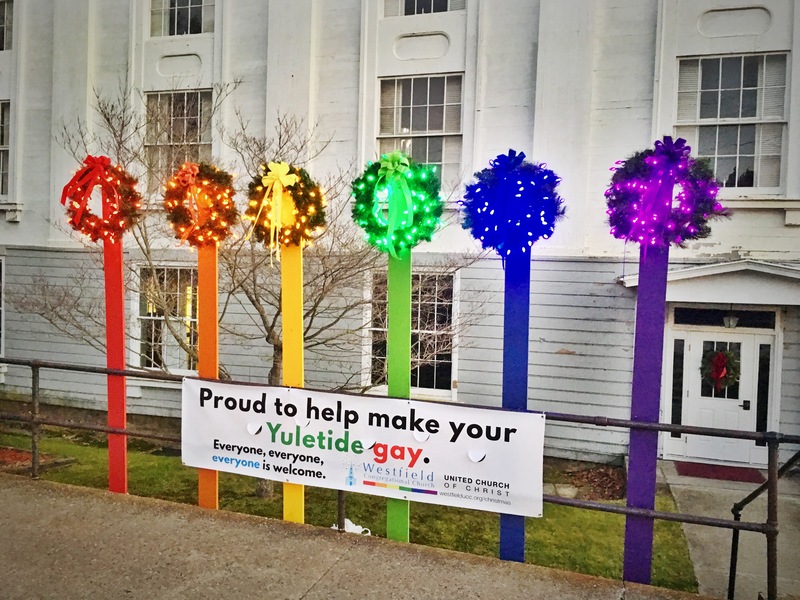 It’s been twenty-two days since Westfield’s charming doors, colorful wreaths, and playful bunnies became the rubber on the road of standing beside a targeted community. The terror began in the early morning hours of Sunday, June 12. I awoke to a digital notification: “22 dead in Orlando shooting.” Three hours later, in the middle of announcements during our regular Sunday morning worship, I stole a glance at my phone. “Forty-nine dead in Orlando shooting.” I was at a loss. How could it have jumped that quick? What happened? Who? Why? I think we were all asking questions that day. I was scheduled to be on vacation starting Monday, June 13, but by Monday morning it was clear that, even in our little corner of Connecticut, there had to be some kind of response. It was a whirlwind of a day. 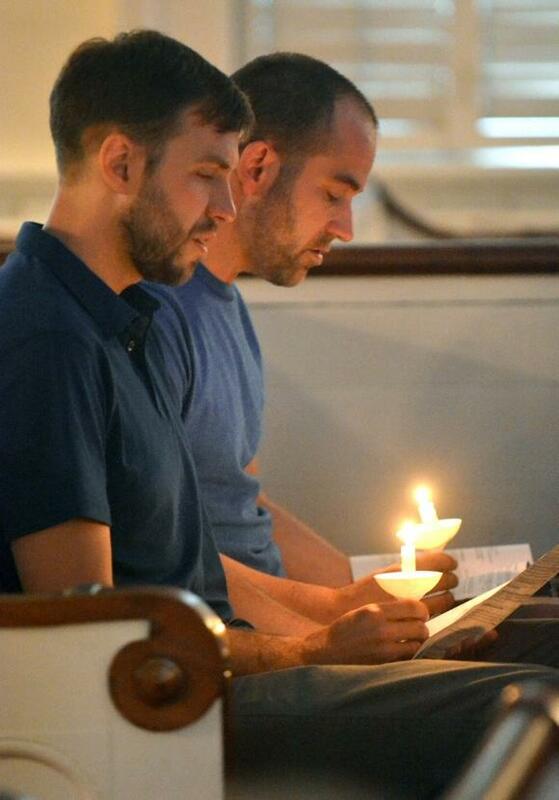 My husband, Greg, offered to put together a vigil for the the LGBTQ community in our Quiet Corner. 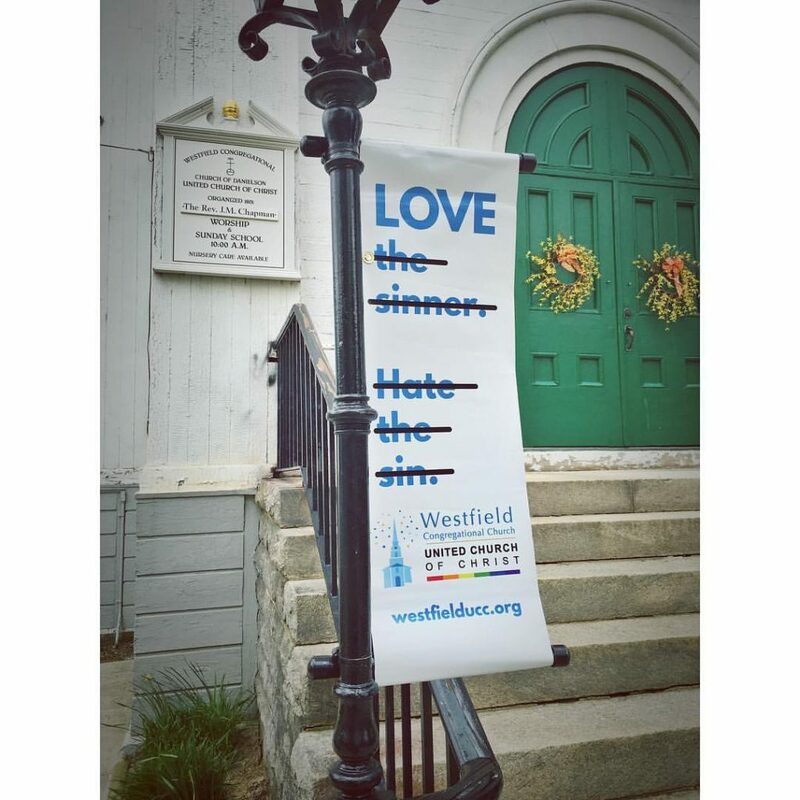 My church, Westfield, was uniquely position to respond to this particular tragedy. Our vocal support of the LGTBQ community since that 2014 vote is magnified by the fact that their pastor (me) is openly gay. 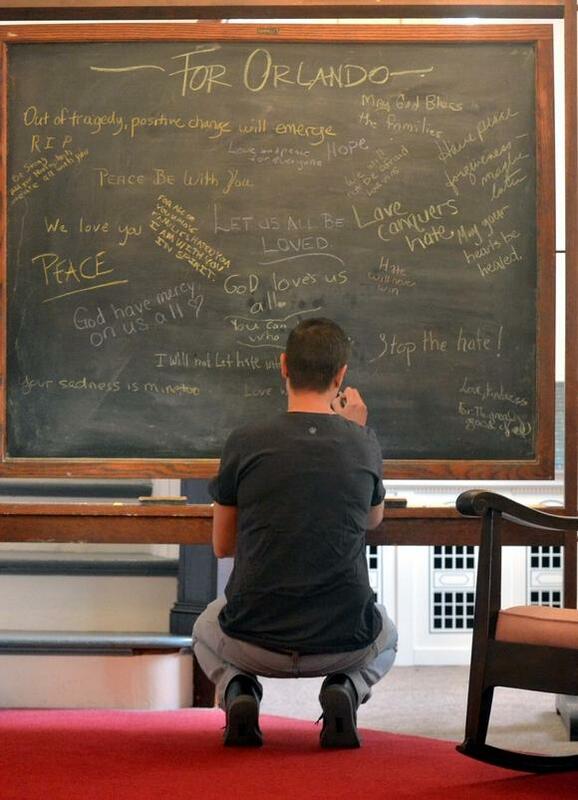 That morning, I sat at my computer and wrote one of the most difficult emails I’ve had to compose to my congregation responding to the violence and inviting them to that night’s service. How I’ve come to loathe having to sit at my computer to figure out what to say this time that I haven’t already said before about violence and tragedy, loss and hope. I’d be lying to you if I didn’t confess that this shooting feels different to me because I’m a member of the LGBT community that was specifically targeted. I feel vulnerable and uneasy. I feel angry and resentful. Yet, at the same time, I find myself filled with such gratitude that I serve a church that’s made it clear that everyone, everyone, EVERYONE is welcome–including people like me. 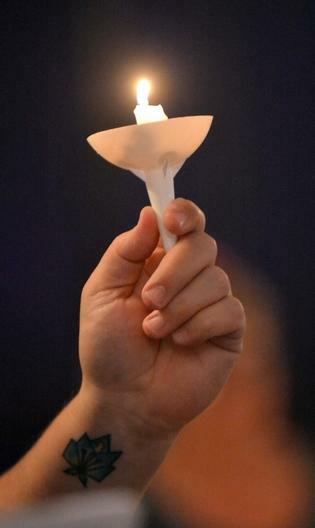 Join us tonight (6/13) at 7pm in Westfield’s sanctuary for a vigil–a time to mourn what we’ve lost and believe things can be better; a time to lament violence and proclaim God’s realm–where mourning and crying and pain will be no more. If you can’t make it, will you pray with me now? Almighty God, through eyes dimmed with tears we look to you in our time of devastation. For Orlando, we pray for peace. For the LGBT community there and everywhere, we pray they feel your love and ours. For the Latinx community that was particularly affected by this atrocity, we pray for your arms of compassion to surround them. Inspire us to action, Holy One, that we might stop settling for violence. Inspire us to stand up and proclaim your realm of radical, inclusive welcome and love–that homophobia, racism, and violence would be no more. We pray this in the name of the One who faced violence unto death, and rose again–the One we call Jesus. Amen. Just so you know, I love you. On a whim, I emailed our local radio station (WINY 1350) about the vigil. Within minutes, the station owner, Gary, called me. “Would you be willing to go on the radio right now to talk about what you’re doing?” “Sure,” I answered, half excited–half stunned. Once that interview was over, Gary called back. “Can I swing by the church and do a Facebook Live video with you?” “That’d be great!” I replied, wondering what I’d gotten myself into. “When?” I asked. Fifteen minutes later, Gary O. (as he’s lovingly referred to) and I were standing in Wesfield’s sanctuary with my administrator, Carrie, dutifully holding a cellphone as still as she could. She counted down–3, 2, 1. And then, we went live. It was viewed thousands of times. And with each play, Westfield lived more fully into who it is called to be–a church that welcomes everyone, including folks that time and again have found themselves so unwelcome in church. After running home for a quick bite, there was nothing to do but wait. I wasn’t sure anyone would come. It had been super late notice, after all. And most LGBTQ folks around here left for greener, more urban pastures. But as the minutes ticked toward 7pm, people began to trickle in. I hadn’t been very emotional all day. I was in work mode. You know the one–the one that says “just get it done.” It wasn’t until a local couple knelt at the foot of the cross that I lost it. These two men walked up to the kneeler–a kneeler used in countless weddings–and knelt together. And in an instant, they went from pseudo-composed to weeping. And at once, the gravity of it all hit me–the tragedy of Orlando, the welcome that had for so long been avoided not just in our church but churches across the country and world, the community Westfield had become, the reality that it could’ve been any one of us–that it still might be. I paused for a moment, searching for something–anything. “Actually,” I continued, “that’s a lie. I do know what to say…What in the hell were you thinking?” And so started ten minutes of public lament that poured out of me. How grateful I am to those who patiently let me talk and ramble and pray. We read their names–all of them. We gathered in a circle and lit candles. And sang of circles being drawn wide, despite fear and violence. People left (hopefully with a little more hope in their hearts than they arrived with), and I locked the doors and turned off the lights. And I went home. The next day, I started vacation. My first Sunday back at Westfield was Sunday, July 3rd. It was our Annual Celebration of Liberty (which is a post unto itself!). Before we started, during our announcement time, one of my church members stood up. I thought she was making an announcement about our upcoming potluck. Now listen, I can be real particular. I’ve got high expectations for myself and for my church members and, on the whole, that serves us well. We’ve come back from the dead, after all. So, it goes without saying that surprises in church aren’t generally my thing. But this one got me. This is the church that, four years ago, was convinced they were welcoming enough. And that, in case there is any question, is how Westfield found its pulse. EDITED TO ADD: Thanks to the Norwich Bulletin for such great pictures, to Carrie Taylor (my God-send of an admin) who rolls with the punches like no one I know, and to my beloved, Greg, who jumped into action and helped to make this happen. Greg, every day I thank God for you. Truly beautiful and inspirational. I wept. Jon…….you are very special. I am so grateful to have met you and feel blessed to be getting to know you better. And like Candace, I wept. Not the first time your beautiful words have brought me to tears. Sometimes in sadness and sometimes in joy. I am reduced to weeping as I read and listened. I re-published this whole article on our church’s website because I think it’s important for our church to read and absorb the messages of this article as we begin our ONA journey. Like Westfield, most here believe we are “open and welcoming” and that’s enough. 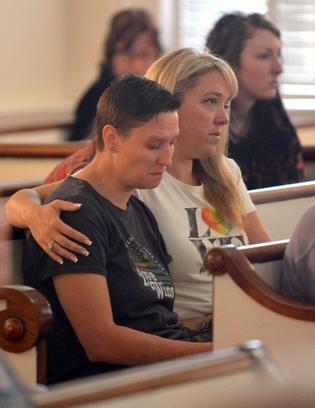 Thanks to my husband, Lee, who is spearheading the ONA process investigation with his team, and to our wonderful Pastor, Victoria, someday in the years to come, our church, too, will be able to stand as an ONA community with pulse as strong as your. Bless you, Pastor Jonathan and your wonderful congregation. Pray for us, please! Weeping as I read this post and watch/listen to the interview. So wish that I had been there to lend my support and love. You are such a special gift to this congregation, and to me. Just what I would expect from am Elon/Emory grad. Seriously, Jon I have heard a lot about you from my sister Joan, all good. It is great to finally read some of your work. Those of us who have worked through the ONA process know what a joy it is and what blessing it brings. Keep up the great work! I am truly awed by the depth of your wisdom, courage and faith. God be with you forever. You are an amazing man, Jon Chapman, and an even more amazing Pastor. I thank you from the bottom of my heart for leading our community. We are blessed. Thank you for all that you do. It’s not often that I’m moved to tears, but it seems that you have the knack for doing just that. Heartfelt, caring, sincere, truly moving.